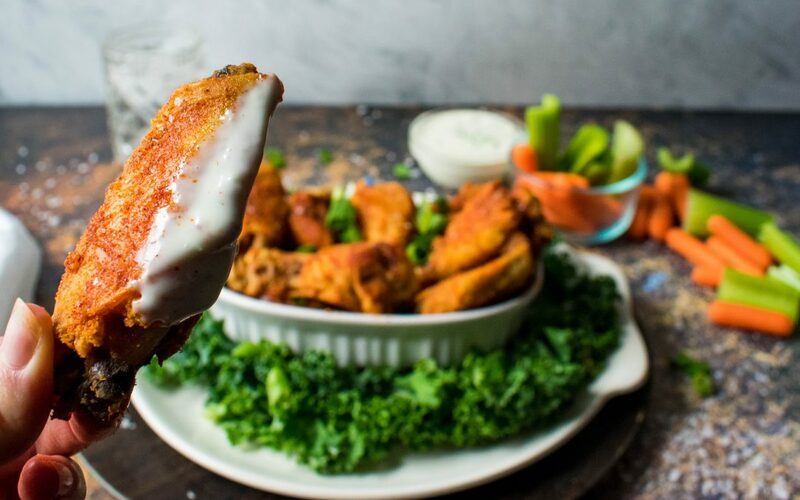 These Chipotle BBQ Dry Wings taste just like Buffalo Wild Wings Chipotle Barbeque Wings, except with fewer carbs, and all-natural ingredients. This recipe is fried in super-healthy coconut oil, and you’ll know every ingredient that’s in it. There will be no mystery as to what exactly you are eating. These DIY Low-Carb Chipotle BBQ Wings taste just as delicious as Buffalo Wild Wings, but contain fewer calories, and all-natural ingredients. My family has a super-American tradition. Every time a new Marvel movie comes out, we go out to eat at Buffalo Wild Wings and, then, go to the movie theater next door to watch Iron Man and his friends save the world. We gorge ourselves on hot wings and mini corndogs and have an All- American good time. Even after I started Keto, we kept this tradition, because many of the traditional wings were already low-carb. However, when we went a few weeks ago (to see Captain Marvel), I plugged my meal into my carb tracking app, and the wings were ALL I was allowed to eat that day. The single meal was nearly 1600 calories! I had already planned to go over for the “special occasion,” so the calories didn’t bother me. It did start needling me, and it peaked my curiosityty. I went home, and started trying to mimic the Chipotly BBQ Seasoning, and within a few tries got pretty close. Then, it was to choose the oils and lower the calories. It took several times to get it just right! This has since become one of my husband’s favorites. 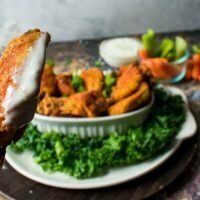 Follow this process, and you can have your own super-healhty keto wings that taste just like they came from a restaurant. The first step is to mix the dry rub ingredients together. Use the recipe for the dry rub here. After defrosting your chicken wings, you will need to rinse them and clean them. This is a very important step, and a bonus to making your wings at home. You know exactly what shape they were in when you fried them. After you clean them, add a little bit of salt to them. Heat the 1/3 cup of coconut oil in a deep frying pan over medium heat. If you’re not used to cooking with coconut oil, it is important that you don’t heat the coconut oil on high heat, because it burns much more easily than vegetable oil. Once the oil is hot, add the wings. Be careful not to fill the pan so full you can’t flip the wings. I cook the wings for twenty minutes total, flipping them every five minutes. The wings will be golden brown when cooked to perfection. You can easily tell when the chicken is done, because it will start to pull up off the bone on the ends. Do not be stingy with the dry rub at this point. Make sure you get all sides of the wings generously. 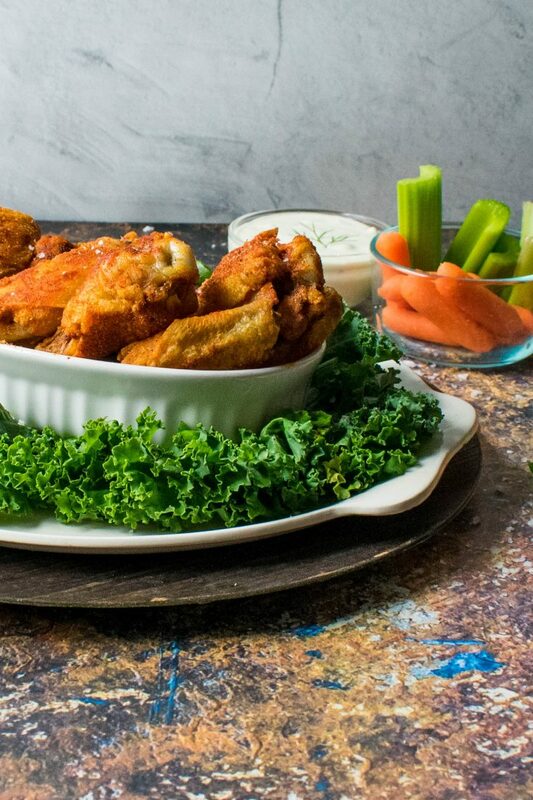 These wings are delicious served with natural bleu cheese or ranch dressing. 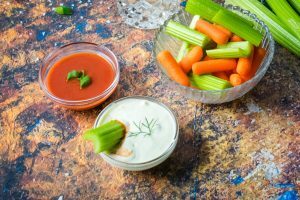 I also like to add carrots and celery sticks, just like you’d get at Buffalo Wild Wings. 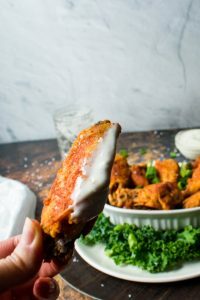 This recipe is a clean low-carb copy-cat version of the chipotle barbeque wings at Buffalo Wild Wings. They are every bit as delicious and much better for you. Heat oil in large deep pan. Fry wings on medium low heat about 10 minutes on each side. As soon as you remove wings from frying pan, dust them lightly with the chipotle bbq dry rub. I hope you love these wings as much as we do! They pair well with sweet potato fries or these awesome zucchini chips as a low carb alternative. I suppose the million dollar question is are we going back to Buffalo Wild Wings? Now that I can make a much healthier (but just as good) version of my favorite dish, will I go back to that restaurant? Heck Yes! Even this weekend for ENDGAME!